Written by two expert teachers and based on astronomy education research, this workbook guides students through concepts, promotes quantitative literacy, and increases student confidence in their understanding of how the universe works. Thirty collaborative, hands-on activities were written to be completed in pairs or small groups in any size classroom. Every activity guides students through the logic of the concept—such as the causes of moon phases, explored in Activity 4—and fosters critical thinking skills. Each activity is organized by learning outcome, giving instructors flexibility and making it easy to match course goals with assignments. Pre- and post-activity questions, available in PowerPoint, and as automatically graded questions in the Coursepack, allow instructors to assess specific skills inside or outside the classroom. 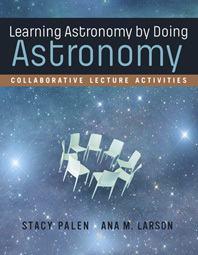 Learning Astronomy by Doing Astronomy activities are evenly distributed across the introductory astronomy course. Instructors will have as many choices in the first half of their course as they have in the second half. Many of the activities ask students to do some quantitative thinking—such as reading graphs or understanding units—to support the basic skills most instructors want their students to develop as scientifically and mathematically literate individuals. These class-tested activities can easily supplement or replace “lecture.” The instructor’s materials, written by the authors of the workbook, provide a complete guide, including pre- and post-activity questions that can be used with clickers. Activity 3: Where on Earth Are You? Activity 9: Where to Put the Telescope?